The final day of EuroBasket Women action in Katowice determines the final placing in Group F. Latvia and Montenegro play for first place, while Spain and Croatia meet in the winner-goes-through and loser-goes-home match. France can not finish higher than third and face Poland in the opening game. France finished third after beating Poland in the opening game (58-54). They scraped through in the end as the hosts tired. Croatia's three-point shooting and a higher rebound rate made them win against Spain (75-71) to take fourth place to go into the next phase while Spain are eliminated from this EuroBasket Women competition. Sandra Mandir was the top scorer for Croatia with 24 points while Mirna Mazic took 15 rebounds. With Spain's defeat their dreams of the Olympic Games 2012 have been shattered. Montenegro is the only undefeated team in the EuroBasket Women 2011 competition after beating Latvia (74-70) although their opponents gave them a hard time they managed to stay on top of the situation. For Montenegro Jelena Dubljevic scored 20 of her 24 points in the first half while she made sure that she scored at crucial points at the end of the third and the fourth quarter. 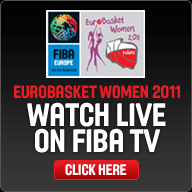 You can read the stories from the EuroBasket Women games of interest by selecting the link below. France got off slowly and missed a lot of shots, while Poland were slow but steady. Agnieszka Szott opened the scoring after a minute of play. Although Emilie Gomis scored the next 4 points for France Elzbieta Mowlik responded for Poland with back to back scores. Both teams went cold on the shooting front for the next three minutes before Mowlik added 2 more points to her counter. Pierre Vincent started his bench rotation: Nwal-Endéné Miyem and Isabelle Yacoubou-Dehoui got on the scoreboard but Mowlik continued her scoring festival with a trey and a couple of free throws for her side to lead (13-8). France continued their master class in the act of missing while Ewelina Kobryn (right in picture) opened her account for the hosts to lead (15-8) by the end of the first quarter. France were more aggressive defensively in the second quarter and only conceded 4 points. Yacoubou and Sandrine Gruda got France off to a good start with some quick points. Gomis was denied a basket after consultation with the officials and match commissioner due to a 24-second violation. This incident appeared to spur the French players up. They started to take control of the game with a trey by Marion Laborde that started a 7-0 run for her side to regain the lead (18-17) after 16 minutes. Kobryn briefly stopped the French opposition as Poland went back in front (19-18). France ended the quarter with a second trey from almost the same position to head into the locker room leading (24-19). France appeared to be crusing (35-28) with 25 minutes played. But then they lost Edwige Lawson-Wade and seconds later Céline Dumerc (left) took a hard knock to her nose. Dumerc stayed on but France went flat and suffered a 13-0 hammering from the hosts and trailed (39-44) going into the final quarter. France still had scoring problems at the start of the final quarter while Poland extended their lead with the first points of the quarter to complete a 15-0 run. Gomis finally broke the seven-minute barren spell with back to back scores. However Poland went further ahead (52-45) with four minutes remaining as Kobryn continued her one-lady show supported by Paulina Pawlak and Agnieszka Szott. Yet France started to pick up as Clémence Beikes regained her scoring touch and Dumerc was back to her normal self chasing everything down. Poland started to struggle offensively. With two minutes left to play Gomis fired a shot in from the land of many after some nice work from Beikes for France to take the advantage. The only scare for France came with 21 seconds left to play when Dumerc tripped on her opponent. She seemed to be in pain but she completed the last seconds to score the last points from the free-throw line for her side to win (58-54). Croatia's three-point shooting skills are not a secret and the five they hit during the first quarter set them up for the rest of the game. However their victory came about with their rebounding and their low turnover count. They had a total of 45 rebounds of which 36 were defensive. In comparison Spain had a total of 38 rebounds. While Sandra Mandir's 24 points and 3 assists and the 15 and 12 points from Luca Ivankovic and Jelena Ivezic will make the headlines, the match winner was the unselfish Mirna Mazic who had 15 rebounds to go with her 4 points. 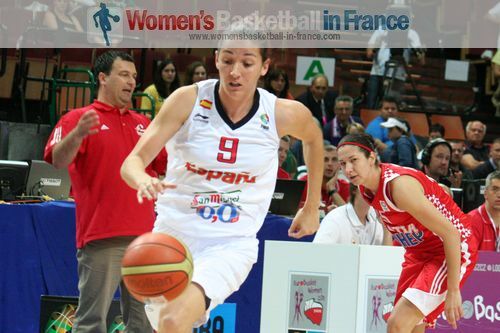 For Spain Laia Palau was at her best with 19 points. Lucila Pascua chipped in 17 points while Elisa Aguilar scored 12. But Sancho Lyttle could not perform well as she was carrying an injury. Sandra Mandir opened the scoring from her position just behind the three-point line after 30 seconds of play for Croatia. She was to score again 90 seconds later with a drive to the basket. Spain finally got on the score sheet with Anna Montañana hitting a fade-away jump shot just behind the free-throw line. The pace immediately picked up. Jelena Ivezic went charging down the other end to fire a shot from the land of plenty (8-2). Spain started to play with more urgency. With 2:29 left to play in the first quarter they tied the game (11-11) off a fast break from Laia Palau. Croatia continued to fire in shots from beyond the arc, 5 in total, while Spain scored on fast breaks and from the free-throw line. Croatia still edged the first quarter (19-15). Croatia tried to accelerate the pace at the start of the second quarter with Mandir scoring quickly. However Sancho Lyttle was on hand to keep Spain on the tail. Croatia's sixth three-pointer of the game came from Ivezic to give Croatia a 6-point lead (28-22) with eight minutes still to play in the second quarter. Spain stopped Croatia from takings shot from beyond the arc and also won lose balls. But it was not until Palau took over that Spain started to play. Palau was everywhere, in her opponents' face, contesting rebounds and scoring. Her energy was infectious and Spain finished the quarter with a 10-0 burst to go into the locker room ahead. Palau continued from where she left off scoring the first 2 points of the quarter before the spectators could settle into their seats. Both teams more or less traded score for score for the first four minutes with Spain surviving a Mandir trey to stay in front (50-49). Spain then went 5 points clear off the scoring by Lucila Pascua and Lyttle. When Spain failed to score for the remaining 3 ½ minutes Croatia nailed their 8th three-pointer during a 5-0 finish to trail by a single point going into the final quarter. The final quarter followed the usual pattern. First Spain scored back to back two-pointers while Croatia replied with a three-pointer. With five minutes left to play the teams were level (61-61). Croatia broke the scoring sequence to regain the lead with 4:26 left to play with their captain driving into the lane. Croatia continued to push Spain. Iva Sliskovic somehow got under the basket to score in between a number of Spanish players with two minutes to play. While Spain failed to score Croatia played the same tactic but this time fed the ball out to Mandir who hit 2 points. Spain had 66 seconds to save the game. A big three by Elisa Aguilar gave the Spanish fans some hope. Whereas Palau used all the tricks to save time by allowing the ball to roll as far as possible before picking up on inbounds. All was in vain as Croatia went 8-of-10 from the free-throw line. Spain’s EuroBasket Women campaign has come to an end and the Olympic dream for 2012 is also over. Everything went right for Latvia from the tip-off of their last match in the EuroBasket Women qualification round with all starters getting on the score sheet within the first three minutes. Montenegro's coach required a time-out with 6:14 to play in the first quarter with his team trailing (4-12) to stop the leakage. Latvia continued their bombardment and went 10 points clear (16-6) with five minutes played. Then Montenegro recovered their composure. With Jelena Dubljevic pounding away on the boards they reduced the deficit to (16-22). Montenegro started defending harder in the second quarter forcing Latvia to change their approach. However once Montenegro found their scoring touch there was nothing Latvia could do. Montenegro were not missing: they converted 10-from-13 field goal attempts. A 14-0 run put them in control (35-26) with four minutes remaining to play in the half. Latvia saved themselves being blown away with perfect shooting from the free-throw line (36-45). Latvia switched back to the fast break approach in attack while using a 2-3 zone to stop Montenegro from scoring in order to bring down their deficit. With Montenegro going scoreless for two minutes, the coaching staff called for a time-out with two minutes left to play despite leading (54-48). With 1:40 left to play Zane Tamane from Latia went down ackwardly and had to leave the court. On the very next attack Montnegro took advantage of the extra space without Tamane in defense and ended their barren spell with a long distance (two-pointer) jumper from Anna De Forge. Worse was to come for Latvia as Dubljevic was able to fire in another long distance two-pointer for Montenegro to head into the final quarter with a 10-point lead (58-48). The two teams continued to score frequently in a fast paced quarter. Montenegro led (69-61) with 3:17 left to play. Latvia stepped up and with first Gunta Basko making a score from nothing, quickly followed by a trey from Liene Jansone. Latvia were on a run. Elina Babkina made it a 2-point game (68-70) as she concluded a fast break started by Basko. Jelena Skerovic (right) steadied her players' nerves with a crucial score. Latvia took their last time-out with 48 seconds left to play. Babkina pulled off another amazing shot as the match went down to the wire. Dubljevic once again came up with a big score but more importantly she took the defensive rebound that brought the game to its end (74-70). Montenegro win the group and are the only team in this edition of EuroBasket Women that are unbeaten.